Moments after finishing Ironman Vichy 2016 I think I decided I was going to be doing Ironman Bolton. I didn’t even think about it, of course I was doing it. 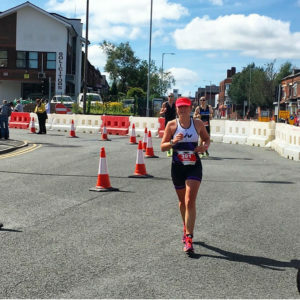 I had just finished 3rd in my age group after a 4 month back injury with no run training, and Bolton had just had one person in my age group – and she didn’t finish. 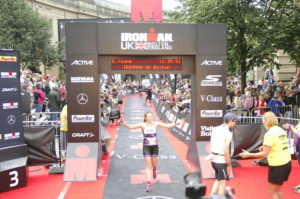 In my mind, this was an easy ticket to the Ironman World Championships in Hawaii, Kona. 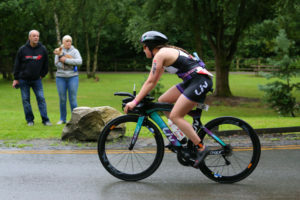 Apparently every 18-24 year old female triathlete was also thinking the same thing! This year I got a coach… it was time to step it up a little and take some help (Dad’s generally know best but sometimes you need a professional)! 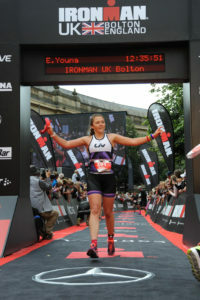 At this point I didn’t know how many had entered Bolton and still had high hopes that this would be a good shot at Kona. I worked really hard this year… really, really hard. I (the girl who trains long and slow and didn’t even know what tempo meant) put in track sessions, tempo sessions, swim sessions that made my lats seize up, swim sessions with drills I had never even heard of, multiple lonely 112 mile rides (plus a run). I found the last few months leading up to my race really hard – physically I was coping but mentally I was struggling. There was a few tears before heading out for 7 hours lonely on the bike, I felt tired of being tired! So despite feeling like I had been Ironman Training non-stop for as long as I could remember (I’m so dramatic), Bolton quickly crept up on me as I found myself lining up in my wetsuit this Sunday, about to start my 140.6 mile race. Naturally it was raining – of course it was raining, this is England! I braced myself to drop into some painfully cold water (you know you’re a fair weather swimmer when water temperature is even a concern on an Ironman). The water was actually warm! 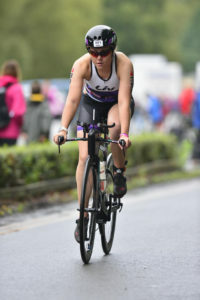 It was a two-loop course, and the first lap went great… I barely got kicked/punched by anyone and felt like I had lots of room to move, sighting was difficult in the murky water but it was all fine, the only issue being how long the first lap felt! I never push myself too much on the swim; I focus more on trying to get through it. 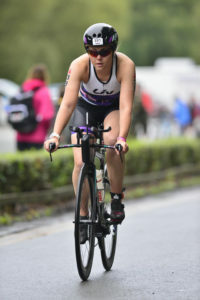 Swimming is definitely not my strongest so I always hope to make up any lost time on the bike/run. The second lap wasn’t quite as smooth, it was much more congested and I got a nice big kick in the chin just to remind me that the day wasn’t going to be a pleasant one! T1 didn’t go to plan… I could have had a nap in the time I spent there (over 7 mins! 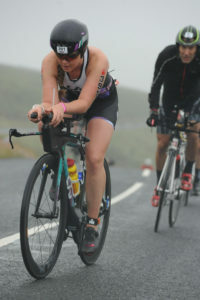 ), I couldn’t attach my Garmin to my bike, I couldn’t fit my gels and gas canister in my tri top, I was flustered. It was still raining and the wind felt strong (you lied Mr weather man), so it was tough from the moment I sat myself on the saddle! Sheephouse Lane (the famously tough, long, tough, tough, tough, long climb that you do twice on the Bolton Ironman bike course) appeared before I even knew it! The crowds here were absolutely ridiculous – so much energy, appreciation and support. There was even a party at the top – I’m talking lights, speakers and music, half naked men with masks on shouting at me to keep going! Massive thanks to everyone there for that – you were amazing! The rest of the course is also hilly with some narrow, pot-holey roads, making for some tough riding, especially in the wind and the rain! At about mile 20 felt all of my gels fall out of my tri top pocket – not ideal, swiftly followed by my gas canisters and bike pump (bye, bye £60). I had 2 gels and some energy bars in the front of my bike so I wasn’t too worried…. 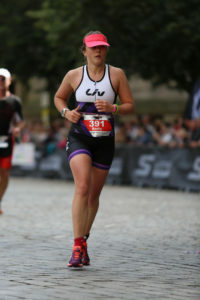 Until I felt my leg doing an unfamiliar spasmming sensation, followed by what felt like the start of cramp! In sheer desperation I started to lick my own arm for salt…. I lost all dignity at this point! 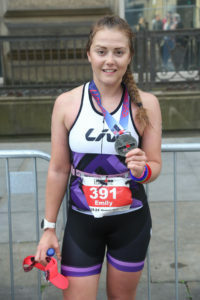 I was in all kinds of panic at this point, I even lost hope of completing the run – the only bit I always feel confident that I will definitely complete (even if I have to crawl it)! Once I got to the next feed station I downed a bottle of the electrolyte mix that they hand out – it seemed to work! I don’t know this is a good thing or not, but I hadn’t even looked/asked anyone what the run course was like. I had no idea what to expect… I wasn’t too worried about the run – I should have been! Meters from leaving T2 I was met with a huge hill! Admittedly the first 10k went by relatively fast/easy (around 50 minutes), so far so good. Around 6-8 miles in we got to Bolton centre where it’s 4 loops of a course, including more hills!! The pain quickly started after the first 10k – not my legs, but my feet! Without being dramatic, it genuinely felt like someone was lighting the balls of my feet on fire, so much so that EVERY feed station had me pouring water on them in an attempt to relieve it. Of course doing that only gave me seconds without the pain, and then I was just left with soaking wet feet and the rest of a marathon ahead! With three laps in the course you got a different colour band with each one you did – it’s super demoralising running past people with more bands then you! 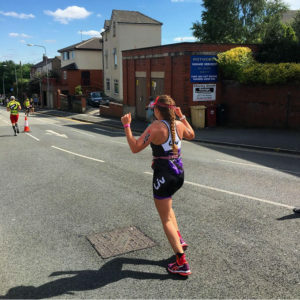 I managed to spot my friend Eddy (Chemo 2 Cardio – please go check him out and donate, he’s and incredible person with an amazing story!) that really gave me a boost, followed by my friend Chloe (Chloe in motion is her Instagram handle – another amazing person I am now happy to call my friend). Finally the end was approaching, and even with just a mile to go I still had to take the time to relieve my feet (well, attempt to) by pouring water over them. 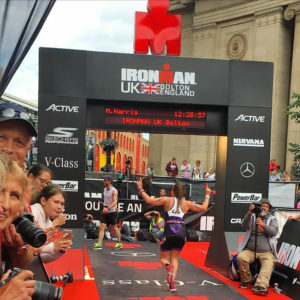 Running over the finish line was a complete blur… I didn’t even see my support team, but I was once again named an Ironman as I crossed the red carpet and threw my hands up in relief! 12:35 hours of suffering, 2nd place age grouper, and I’m now proud to call myself a x2 Ironman finisher with more to come! 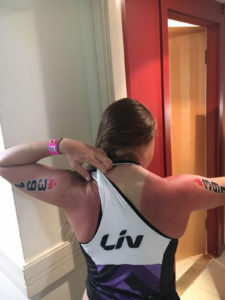 ** Special thanks to Liv Cycling – I am so proud to be an ambassador! HUGE thanks to my coach Steve – he not only helped me get fit for this race but he also helped me stay sane! My boyfriend Sam for only ever supporting me despite the fact that my whole weekends involve being on a bike and not seeing him! For being a better athlete then me and therefore pushing and inspiring me, and for spending 12:35 hours cheering me on! 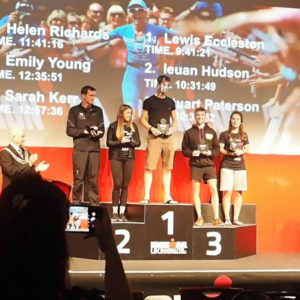 Mum and Dad for being unofficial sponsors, putting up with a tired and hungry daughter, cheering me on all day and being my biggest fan’s (sorry if you follow them on Instagram), and Dad for training with me and inspiring me to become an Ironman in the first place! 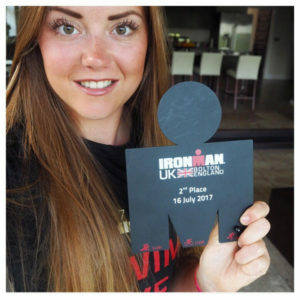 Everyone reading this blog and those that follow my training, thank YOU! Oh wow this is an amazing post and congratulations to you on reaching second place in age group. I feel like I could feel your pain at all those points you were feeling it getting tough! Hope you’re recovery is going well now. What’s on the cards next for you?